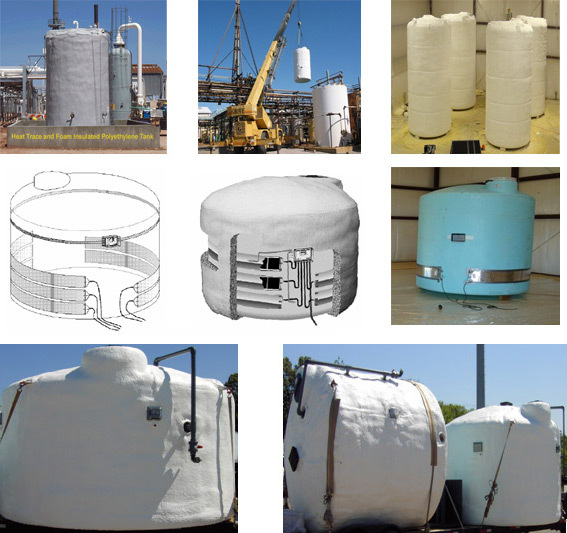 Protank is known nationwide for our heat traced and insulated tanks. We can heat trace and insulate most of our tanks. The most common are our vertical tanks ranging from 300 to 16,500 gallons. We also heat trace and insulate our horizontal tanks, double wall tanks, cone bottom tanks, and more. Our systems allow you maintain a set temperature for your stored liquid. The system consists heat tracing applied to the lower part of the tank, electronic control box, and 2” of painted polyurethane foam. We can paint our tanks in a white or gray color. Our heating system components shall be Nema 4 rated and factory pre-wired for 110VAC. We can add fittings, external down fills, flanges, sight gages, level sensors, ladders, tie-down systems, and more. Our heat traced tanks can be used for indoors or outdoors. Some of the most popular chemicals stored in our heat traced and insulated tanks are sodium hydroxide or caustic, potassium hydroxide, and water. Please contact our sales staff with any questions or requests for pricing for our heat traced and insulated tanks.